I’ve always liked Fat Tire (from New Belgium Brewing), and have previously found clone recipes to be a good way to experiment with various styles and flavors. Thus, tonight’s brew was modeled after two different Fat Tire recipes I found kicking around the Internet. These are followed reasonably closely, except for the hops – I used what I had on hand, so this will almost certainly modify the resultant into something Fat Tire-ish rather than a spot-on Fat Tire (if such a thing is genuinely possible). Thus, I’m calling this batch. . . I heated 3.5 gallons of tap water to 154° F (usually hovering around 156° to 158°), and steeped the grains for 45 minutes. 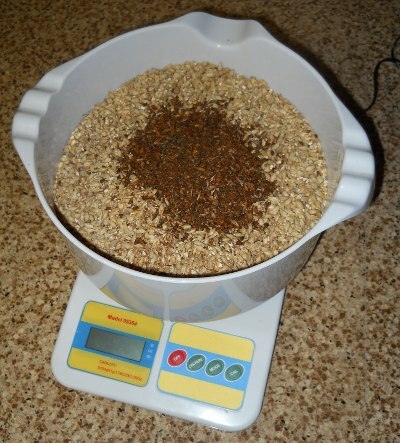 Then, I sparged the grains with 0.5 gallons of tap water at 154°. After boiling for another 10 minutes (for 55 minutes total boil), I added the Mt. Hood hops. After 5 more minutes (60 minutes total of boiling), I cooled the wort with my chiller, added cold tap water to a total of 4.5 gallons, and pitched the yeast. Pitching temperature was 74° F, and starting gravity was measured at 1.052. The wort is a nice amber color (as befits an amber ale). As I refined the recipe, I played around with some calculators for IBU and starting gravity. I got an estimated boil gravity (4 gallon boil) of 1.077; with a top-up to 5 gallons, this gives an estimated IBU of 20.7 and estimated starting gravity of 1.061. My actual starting gravity was a little lower, at 1.052. Part of this discrepancy could be the sludge I left in the bottom of the brew pot, and the other could just be errors in the brew calculator. I’ve never fermented with American Ale II before, so I’m curious to see how it works out. Judging by the Wyeast website, this should be a nice little strain.